Ki-45 Kai Hei of 11th Hakkô-tai 'Kokok-tai' as flown by unit leader 1Lt Kyoichi Miura with tail number '1' in similar overall single colour scheme. Ki-43-II of unknown tokko unit in mottled green over natural metal with red lightning flash on fuselage and rudder number '17'. 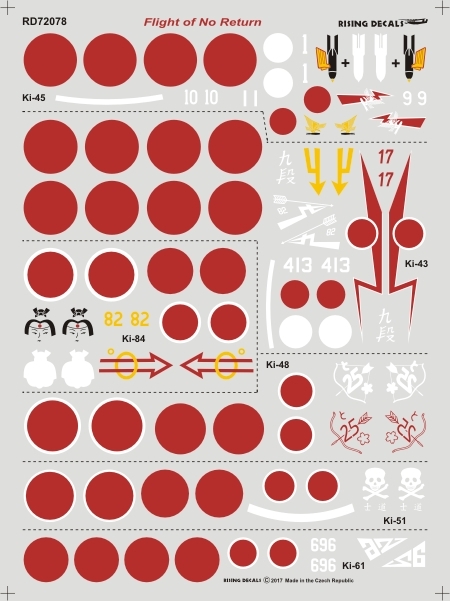 The yellow tail insignia is similar to Hiko Dai 103 Sentai, a unit more usually associated with the Ki-84 Hayate but which reportedly used Hayabusa for training - and possibly special attack. 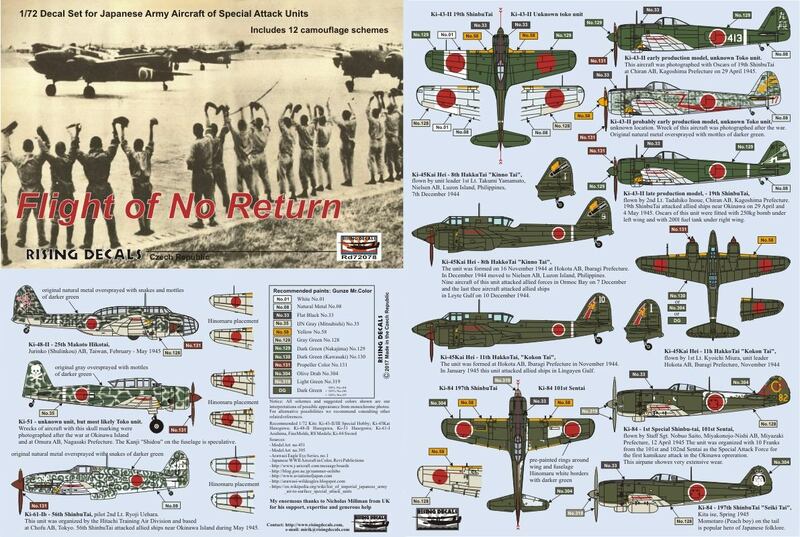 103 operated as part of the 3rd Attacking Group during the Okinawa operations, together with 65 and 66 Sentai and two other Shinbu-tai, sortying aircraft in special attacks against US surface units from Tokuno Shima on 29 March and 1 April 1945. Ki-84 of Hiko Dai 101 Sentai as flown by S/Sgt Nobuo Saito depicted in olive drab over grey-green with tail number '82'. This was another Hayate unit associated with special attacks during the Okinawa operations, forming the 2nd Attacking Group at Miyakanojo with 102 Sentai and two other Shinbu-tai. The finish on this aircraft was heavily worn, with large areas of complete paint loss, so it would make a challenging but interesting subject to model. Ki-84 of 197th Shinbu-tai 'Seiki-tai' in olive drab over grey-green at Kita ise in Spring 1945. This aircraft is distinguished by the large representation of Momotaro the Peach Boy on the fin and rudder. Ki-48-11 of 25th Makoto-hikotai in mottled green over grey-green at Jurinko (Shulinko), Taiwan in May 1945. Ki-51 of unknown but presumed tokko unit photographed post-war at Omura with skull and crossbones on fin and rudder. The kanji characters 'Shidou' - (士道 - chivalry) on the tail are speculative. Ki-61-Ib of 56th Shinbu-tai as flown by 2Lr Ryoji Uehara in camouflage of dark green whorls over natural metal with white number '696' on nose, at Chofu in May 1945. 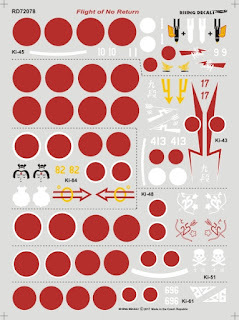 This is an interesting sheet providing the opportunity to model several unusual subjects and to inspire further research into the operations of these, often enigmatic, special attack units. With special thanks to Mirek of Rising Decals for this review sample. The Hakkô-tai (八絋隊 - eight directions unit, from Hakkō ichiu 'eight crown cords, one roof' a saying attributed to the Emperor Jinmu and interpreted by nationalist Chigaku Tanaka to mean Imperial rule divinely ordained to cover the whole world) were those special attack units organised in the Philippines by the 4th Air Army from 7 November 1944 to 13 January 1945. 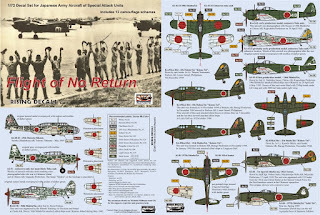 The Shinbu-tai (振武隊 - showing martial spirit unit) were special attack units organised in Japan under the 6th Air Army whilst the Makoto-hikotai (誠飛行隊 - fidelity/loyalty air unit) were special attack units operating under 8th Air Division command on Taiwan, both engaged in the Okinawa operations. 8th Air Division came under 1st Air Army (Japan) command. The 6th Air Army was formed on 26 December 1944 from the Air Training Army, sometimes referred to as the Air Instruction Army. It originally had three roles, the air defence of Japan, to attack US bases in the Marianas and to prepare for the defence of Japan against invasion by attacking the invasion forces. By February 1945 due to practical limitations its role had been reduced to providing a strategic reserve against enemy invasion task forces only. In March 1945 the 6th Air Army was temporarily deployed to the operational command of the IJN Combined Fleet for the defence of the Ryuku Islands (until July) and centralised its operations from Kyushu. Its provisional defence duties (against invasion task forces) in the Kanto sector were taken over by the newly established 30th Fighter Group (Dai 30 Sento Hiko Shudan - 第30戦闘飛行集団). As mentioned previously here 30th Fighter Group then came directly under General Defence Command and consisted (originally) of Hiko Dai 47 and 244 Sentai, the 18th, 19th, 25th, 45th and 47th Shinbu-tai, Shimoshizu Hikotai & Dokuritsu Hiko Dai 17 Chutai (those two units providing reconnaissance support), plus three guide bombers from Utsonomiya Air Instruction Division and two navigation air squads. In July 1945 when 6th Air Army reverted to the air defence of Japan role headquartered at Fukuoka it had about 1,000 special attack aircraft under command in various Shinbu-tai as well as the 30th Fighter Group which then consisted of Hiko Dai 59, 62 and 244 Sentai plus Dokuritsu Hiko Dai 17 Chutai. Other units under 6th Air Army command at that time were 11th Air Division with Hiko Dai 55, 56 and 246 Sentai, 12th Air Division with Hiko Dai 4, 47 and 71 Sentai, 100th Air Brigade with Hiko Dai 101 and 103 Sentai, and 7th & 21st Air Brigade HQs. In addition under direct 6th Air Army command were Hiko Dai 2, 60, 65, 66 & 110 Sentai, plus the whole of the 51st Air Instruction Division headquartered at Gifu. Hiko Dai 62 Sentai might seem an odd addition to 30th Fighter Group but after returning to Japan from the Philippines in January 1945 it was designated as a tokko unit with specialised Ki-67 Sakura-dan and To-go (800 kg x 1 in bomb bay and 800 kg x 1 in fuselage) aircraft, participating in the Okinawa operations and incurring heavy losses. On 12 April 1945 Sentai Commander Maj Shozo Sawanobori was killed in a flying accident with 10 other Sentai personnel during a move from Nishi Tsukuba to Tachiarai whilst on board the 1st Chutai leader Capt Yasumasa Iwamoto's Ki-67. Maj Yuzaburo Ono became the unit commander until the end of the war. * The mix seems to be based on that given in some Hasegawa Ki-45 kits but the ratio as printed results in 130%! If so it should be 30% x 4, 50% x 6 and 20% x 7. 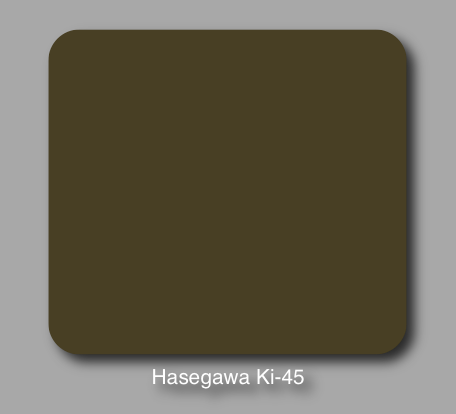 This results not in a dark green as such but in a dark, rich olive brown approximation of the # 7 colour as shown above (from a measured swatch of the mixed paints).The question of "brown" Toryu (and Ki-46) will be addressed in a future blog. Rising Decals keeps coming up with ways to take my money. Thanks for this notice & all your research.